In a society on the go, we depend on reliable brake systems when it comes time to stop. Starfire’s Polymer-to-Ceramic™ Composite (PTCC) materials produce lightweight, tough, and thermally stable composites used in automobile, motorcycle, aircraft, and train braking systems. 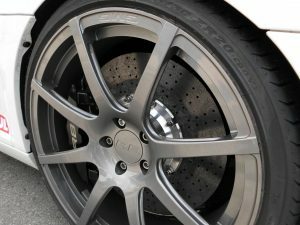 With 33% the mass of traditional metal brake rotors and significant heat and corrosion resistance, our carbon fiber reinforced ceramic composites provide our clients in the friction materials markets with a competitive edge. In one test of our material, we subjected a rotor to tough conditions – similar to driving a 5,500 pound Chevrolet Tahoe at speeds of greater than 160mph to a dead stop. The rotor successfully endured the extreme heat while maintaining an excellent friction coefficient.